If you have clicked on this page, you are probably considering dental implants as your tooth replacement treatment in Egg Harbor Township, NJ. It also probably means that you want to know more about dental implants and how they can improve the appearance, function, and health of your smile. Read on to take a brief tour of dental implants and what has made them so successful for many patients like you throughout Atlantic County, NJ and beyond. Patients with missing teeth often experience some less-than-pleasant side effects. Without the tooth structure supporting your face, the lips, mouth, and facial structure sink in, making patients appear years older than they are. But there is a better option! In just a few short office visits, dental implants can help restore your face shape, improve the strength of your jaw muscle, allow you to chew better, improve your speech, and let you smile with confidence again. Most importantly, dental implants are the only permanent tooth replacement option that can stop jawbone deterioration that occurs when patients are missing teeth. 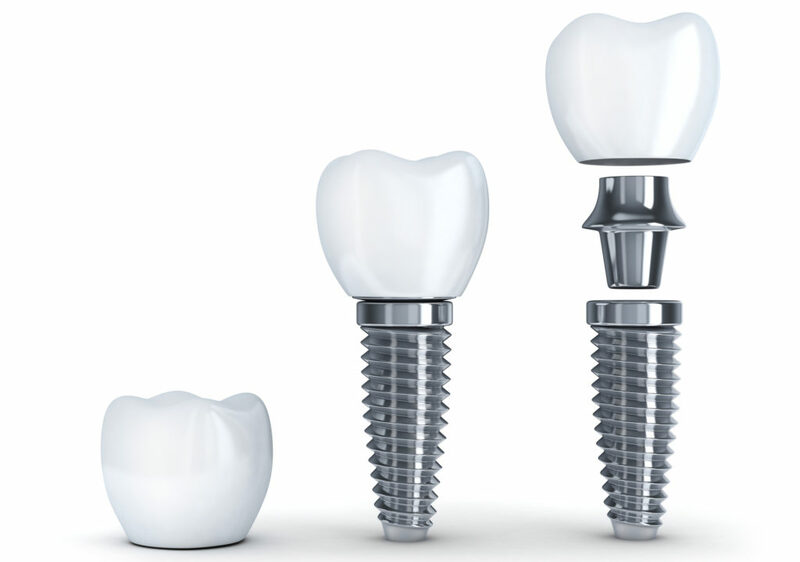 Dental implants are composed of three different parts, a fixture, an abutment, and a crown. Here is some additional detail about each part. This bottom piece is shaped like a small screw and is the first part to be attached to the jawbone. After making a small hole, the implant fixture will be gently inserted and left to heal. During a process called osseointegration, the implant fixture fuses to the tissues of the jawbone in an extremely strong manner. This process is made possible because of the biocompatible properties of titanium, which dramatically reduce the chance of rejection from the tissues in your body. This piece is the second part of the implant placed and is attached to the titanium fixture. Once your implant is healed, this piece will act as a secure foundation for the porcelain crown. Like the implant fixture part, the abutment is also made from titanium. In many instances, this piece is attached to the implant fixture after osseointegration has occurred. However, some patients may receive their abutment directly after the implant fixture has been placed. The crown is the last piece placed and is the only piece visible above your gum line when you smile. This part of the implant is usually made of porcelain. Regardless of the type of implant used, your replacement tooth is customized to precisely match the shape, color, size, and texture of your natural teeth for a seamless and natural smile.